Two at the Table | One couple enjoying dinner together. This is our first non-menu post of 2018, but one that is directly inspired by the menu we posted earlier the week: The Half Baked Harvest’s Easy Coq Au Riesling, which is based on the traditional coq au vin. Whenever we see a recipe for coq au vin, we think of a dinner we had a few years ago at Smoke, a jazz and supper club at Broadway and 106th, during which Tony ordered the dish. We were done with dinner and enjoying the music as much as we had enjoyed the food when water began to drip and then run down from a few spots in the ceiling. The water hit the stage, several tables (but not ours), and the area near the bar. This being New York, we all adapted as best as we could: the band had to stop, but the patrons rearranged themselves at the dry tables, and we got to see a never-to-be-forgotten moment when a waitress emerged from the kitchen carrying not only someone’s dinner but also an umbrella! Eventually, the problem became bad enough that everyone was treated to dinner on the house and asked to leave just to be safe. Smoke closed down for a while, but reopened not too long after the incident and is going strong. Our last dinner there was excellent and the music was very entertaining — as was the couple next to us who were apparently on a first date. A trip back to Smoke is in the cards for us very soon, as enjoying the New York music scene more is one of our New Year’s themes. You might be wondering what a theme, versus a more traditional resolution, is. In our book, (literally, a small black notebook, which we’ve maintained for a few years now) resolutions are things that can be written as goals that are SMART: Specific, Measurable, Actionable, Relevant, and Time-Bound. So, for example, Tony has a resolution to lose 20 pounds by May 1. This goal is concrete, is easy to measure, is in Tony’s control, is essential to Tony’s well-being, and is tied to a hard deadline. Themes, however, are things that are too broad for us to write as SMART goals (like “focus on the present and enjoy the moment,” which was one of Tony’s themes for 2017) or would have the fun sucked right out of them if we tried. A theme of “enjoy the New York music scene more” opens us up to really enjoy it, to do things on the spur of the moment, to appreciate any passing bit of music we hear, or to splurge on big concerts. A resolution of “See a live music show once a month” starts to sound far, far too much like work! Another theme is to eat out more because while we enjoy cooking, we sometimes feel like we’re not taking advantage of all the dining options in New York City. So, while we planned to make Primavera Risotto on Saturday, we reserve the right to make a last-minute change and have dinner at a new Italian restaurant in our neighborhood: Lucciola (Italian for “firefly”) at Amsterdam and 90th. We had dinner there on Wednesday and loved it! The atmosphere was cozy and the service was excellent. Everything we ordered from the Lucciola menu, from the spicy marinated calamari appetizer to the hand-made pasta (fettuccine Bolognese for Tony and paccheri with eggplant alla Norma for Kim), to the tiramisu and ricotta cheesecake for dessert, was excellent. We will be back soon, both to enjoy the food and wine as well as for Tony to practice his Italian! Happy (almost) New Year! We had a great holiday, which included a trip to Austin and several wonderful home-cooked dinners there, some made by us and some made for us. We are as excited as ever about sharing fun new recipes and are looking forward all the cooking and blogging we’ll do in 2018! One of our goal for 2018 is to expand the focus of our blog. We’ll keep developing and posting menus as we always have, but will try to include more posts about how things turned out (spoiler: usually very well!). We also want to give our readers more insight into what we do when we’re not cooking: enjoying traveling, both around our home city and beyond, and visiting restaurants, museums, and fun shops wherever we go. Before we do any cooking or blogging in 2018, we ended 2017 in style, at a New Year’s Eve party hosted by our Upper East Side friends. It was a buffet dinner and Kim made two appetizers. The first was Rachel Khoo’s Sundried Tomato and Ricotta Tapenade, from her “Sweet and Savory Pates” cookbook. The second was Ina Garten’s Green Herb Dip. Kim will also bring a sliced baguette to enjoy with the tapenade and crudités to enjoy with the dip. We’re looking forward to ringing in the new year with good friends — and good food! We’ve had a very fun and very busy week, with our flight back on Wednesday morning from a great visit to Austin, a special dinner on Friday evening of CDKitchen’s Spanish Mussels with Chorizo and Cava, a holiday party on Saturday night hosted by our Upper West Side friends, plus the New Year’s Eve party on Sunday. We decided to postpone our annual New Year’s Day Indoor BBQ for a while, so that we could have a chance to recover from all the fun. Instead, we’ll make a quiet dinner featuring ribeye steaks that Kim’s parents gave us for Christmas. We’ll prepare them using Ellie Krieger’s Cowboy Steak with Coffee and Chili Rub recipe. The coffee and chili mix is one of our favorite rubs, but we’ve only ever used it on flank steaks, so we’re excited to try it on a different, thicker cut. While we’re not doing our Indoor BBQ we are keeping the most important part of our New Year’s tradition alive: eating black-eyed peas for good luck in the coming year. Kim picked out a new recipe for us, The Homesick Texan’s Pickled Black-Eyed Peas, and we can’t wait to give it a try. We enjoyed Ina Garten’s Salmon with Lentils with Kim’s parents over the holidays and this inspired us to find a new lentil recipe. We’ll have our friend Lynee over for dinner on Tuesday, when we’ll try The Minimalist Baker’s Saucy Moroccan Spiced Lentils, which we’ll serve next to some roasted salmon. We typically don’t make dishes with Moroccan flavors, so we’re happy to be expanding our palettes. Kim will be at a New York Junior League meeting Wednesday evening, so Tony will be on his own. We’ll both be out to dinner with friends on Thursday night, but we have a great dinner lined up for Friday night: The Half Baked Harvest’s Easy Coq Au Riesling. This dish is based on the traditional coq au vin, which is made with red wine, but, as the name makes clear, it uses Riesling instead. Tony found this recipe several months ago and stored it away for future use — Kim’s favorite wine, after all, is Riesling — but Kim found it recently on her own as well and suggested we make it. We’ll have the chicken with the New York Times Brussels Sprout Salad with Apples and Walnuts. We’ll close out the week on Saturday by making Primavera Risotto, which we’ll make from ingredients Tony’s sister gave us for Christmas. The recipe calls for white wine, so we’ll pay a visit to our friend Michael at Columbus Wine & Spirits for a pairing suggestion. With a wonderful Thanksgiving dinner (not to mention several other fantastic dinners over the past two weeks), a day trip to Boston on Friday, and a birthday party on Saturday night behind us, we decided we should inventory the fridge and freezer to figure out what to do with all the leftover turkey, pork, chicken, and soup we had on hand. 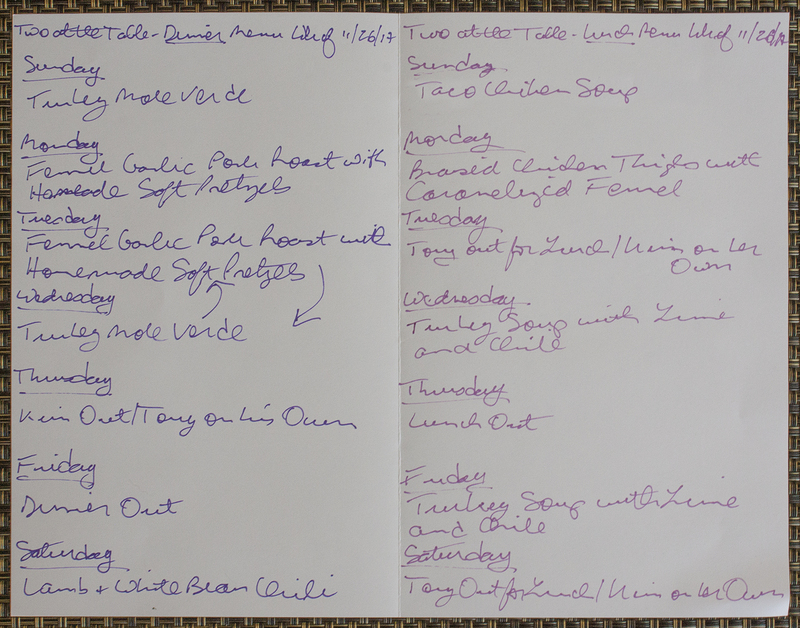 When we were done, we decided that we needed two menus for this week: a dinner menu, which let us try some new recipes, and a lunch menu, which would help us plan how to eat up all our leftovers. 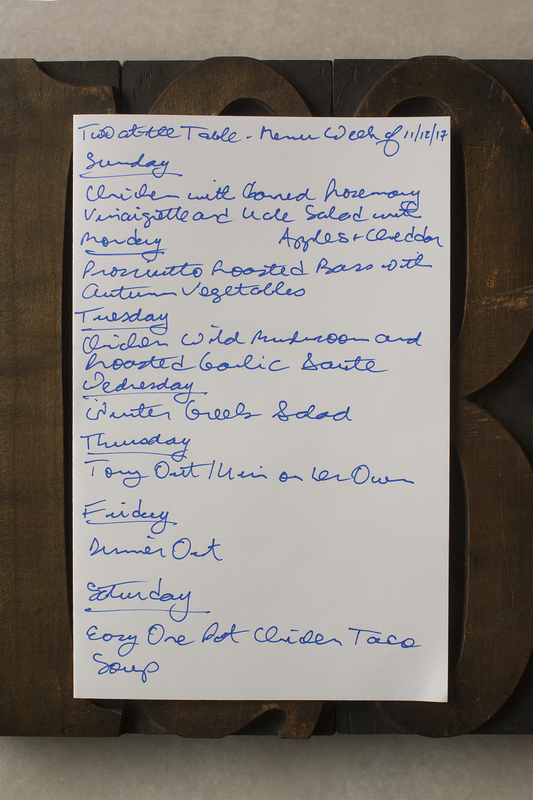 Below is our day-by-day plan for lunch and dinner this week. Sunday: We’re spending most of the day cooking on Sunday. First, we’re carving up the turkey breast left over from Thanksgiving and picking the carcass clean to get enough meat for two dishes we plan on making for dinner this week. Before we start on those recipes, however, we’ll use the turkey carcass to make The New York Times Roasted Turkey Stock. We’d never made a stock of any kind before today and what we learned is that, as the recipes states, it takes a LONG time! You’ll spend an hour just roasting the turkey bones and aromatics (carrot, celery, and onion) and another three hours simmering the stock, and this doesn’t even take prep and clean up time into account. Even so, it is not a very labor intensive process; if you set a timer, you can do other things while making the stock — like writing a blog post! One of the things we did while the stock was simmering was to have lunch. We had leftovers in the freezer from when we made The Kitchn’s Taco Chicken Soup last week. The soup is every bit as good reheated as it was when we first made it. We served the soup with a little fresh grated white cheddar and chopped scallions; it was a perfect lunch for a chilly fall day. For dinner, as we mentioned above, we will use some of the turkey meat and stock to make The New York Times’ Turkey Mole Verde. The mole recipe is not too difficult and sounds like it will be delicious. Monday: Monday will be a day for leftovers. For lunch, we’ll have The New York Times’ Braised Chicken Thighs with Caramelized Fennel, which is one of the dishes we made for dinner last week. It was super flavorful, and we think it will be as good for lunch as it was for dinner. For dinner, we’ll have some of Food & Wine’s Fennel Garlic Pork Roast, which we made last week. We’ll serve this with some roasted butternut squash (yet another thing we’re making on Sunday!) 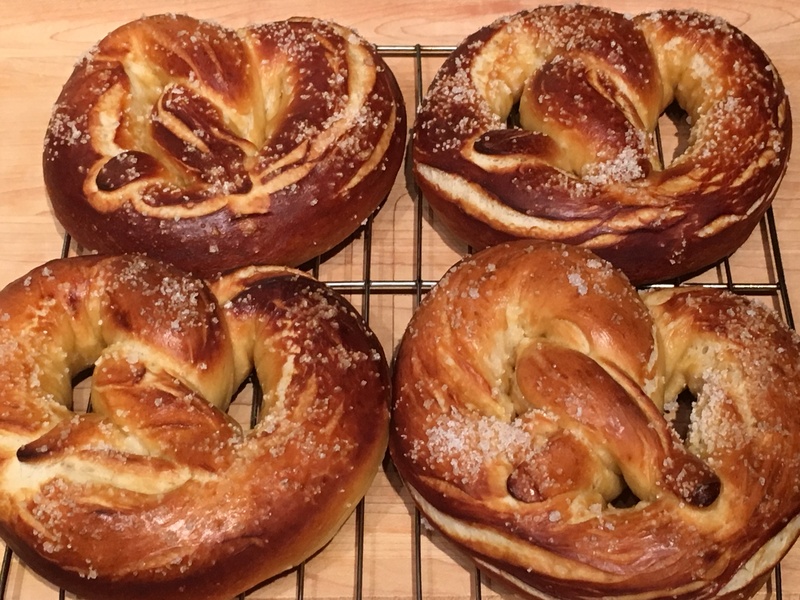 and one of Alton Brown’s Homemade Soft Pretzels, which we made for our Oktoberfest dinner a few weeks ago and have stored carefully in the freezer since. Tuesday: Tony will be out for lunch so Kim will enjoy leftovers from Tasting Table’s Spaghetti Squash with Sage and Walnuts, which we made last week. This was our first experience making spaghetti squash, and it was fantastic! Tony overcame his trepidation and was amazed at how good it was — and how much like pasta it was. Granted, you may never fool anyone with it, but if you’re trying to cut back on carbs, or just want to try something different, it’s a good way to go. For dinner, we’ll have the rest of the The New York Times’ Turkey Mole Verde. Wednesday: On Wednesday, we’ll enjoy the rest of the turkey and turkey stock in a fun lunch: The New York Times’ Turkey Soup with Lime and Chile. We will make this in advance one night this week; we’ll see how the week is shaping up before we decide whether to make it Monday or Tuesday night. For dinner, we’ll have the last of Food & Wine’s Fennel Garlic Pork Roast, the rest of the roasted butternut squash, and the last of Alton Brown’s Homemade Soft Pretzels. Thursday: Thursday will be a very busy day. We’ll both be out for lunch, so there’s no entry for the lunch menu. Kim will be out Thursday night at the New York Junior League’s annual Golden Tree Shopping Fair. Golden Tree brings together many different vendors, selling everything from men’s and women’s clothes, to jewelry, to housewares, to food. It’s a fun way to spend an evening and helps raise essential funds for the Junior League. We’ve been every year for the past several years and always found a perfect gift for at least one or two people on our list. Tony will have to figure out dinner on his own, but with all the leftovers we have kicking around, this should not be too difficult! Friday: Lunch on Friday will be the leftover New York Times’ Turkey Soup with Lime and Chile. We will both be at the Golden Tree event Friday evening and will probably grab a bite out afterward — assuming we can resist filling up on all the great snacks the Junior League will serve, which at past events have included their world-famous pigs in a blanket and mini beef Wellingtons! Saturday: Tony will be with his brother at their mom’s house Saturday morning. They have plenty of chores to do like raking leaves and cleaning the basement, and will also try to make time to work on the wine bottling project. Tony will have lunch with his mom and brother, and Kim will be on her own. With Golden Tree on this coming Friday, we’ll stay in on Saturday night and make something new and different: The New York Times’ Lamb and White Bean Chili. We’ve featured all kinds of chili on The Two at the Table blog, from Food & Wine’s Winter Vegetable Chili and Tony’s Thunder and Lightning Chili in past month to Elie Krieger’s Vegetarian Black Bean Chili with Ancho and Orange just a few weeks ago. This is our first time making chili with ground lamb, and we’re very curious to see how it turns out! We have a busy holiday week ahead, and we’re really excited to enjoy it. We’re going to the New York Junior League’s Thanksgiving Eve Ball on Wednesday night. The Ball has become an annual event for us, and we look forward to it every year. We’ll have a smallish dinner in the evening before the Ball; we need to save room for the Ball’s traditional chicken pot pie, which is served at midnight. We’ll have Thanksgiving dinner with Tony’s mom on Thursday and enjoy the Pillari family’s standard menu of pasta followed by turkey. On Friday we’re off on another day trip to Boston, this time to see the Mark Rothko exhibit at the Museum of Fine Arts. We’ll hit Saltie Girl for lunch and Dirty Water Dough Company for sandwiches to eat on the train ride home, just like we did on our last day trip to Boston. We have plans with friends on Saturday evening, so we won’t be cooking then either. 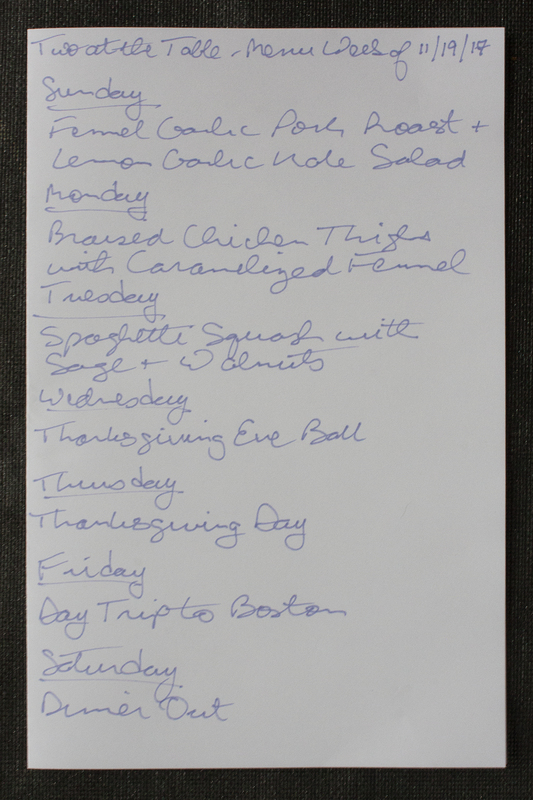 While we’ll be eating out a lot this week, we will do some fun cooking, and, excluding the turkey breast and sweet potatoes we’ll make at Tony’s mom’s, plan to try three new dishes. The first dish will make a comforting Sunday dinner: Food & Wine’s Fennel Garlic Pork Roast. We both really like fennel (and pork, of course) so we think we’re going to enjoy this one a lot. The most time-consuming step is making the overnight brine. This process involves bringing a quart of water into which you’ve placed honey, black peppercorns, bay leaves, thyme sprigs, parsley sprigs, two halved garlic cloves, and salt to a boil, cooling it, and adding two more quarts of water. Making the brine is not hard to fit into a Saturday evening, as long as you remember to do it before you settle down to watch Episode 8 of The Handmaid’s Tale on Hulu! We’ll serve the pork with The New York Times’ Lemon Garlic Kale Salad, which we also made last week, and a few left over roasted vegetables. Tony will be on his own Monday night and will make The New York Times’ Braised Chicken Thighs with Caramelized Fennel. (Like we said, we both really like fennel!) He has his monthly “Beers with the Boys” planned for the early evening, so he will probably prep for dinner at some point in the afternoon so he can start cooking as soon as he gets home. This dish features something we’ve never heard of before: fennel frond puree, which is like pesto made with (you guessed it!) fennel fronds. The recipe makes several servings, so we should have some good lunches this week! For Tuesday night, we wanted to do something vegetarian, so we decided to try something entirely new, namely, spaghetti squash. We found Tasting Table’s Spaghetti Squash with Sage and Walnuts recipes and thought it sounded interesting. Tony has been very leery of trying spaghetti squash as his Italian-American roots make him extremely skeptical of any form of non-traditional pasta, like anything from a can and even whole wheat pasta. He identifies closely, though for different reasons, with Sophia Loren’s famous quote: “Everything you see, I owe to pasta.” But he, like Kim, is an adventurous eater, as the pages of this blog show, and is willing to give it a try! We’ve been doing our usual amount of cooking the past few weeks, but just haven’t had time to post our menus. For example, one great dish we made the week before last was Food Network’s Peppercorn Rubbed and Grilled Flat Iron Steak. This recipe uses a LOT of pepper (1/4 cup of coarsely ground black peppercorns and 1/4 cup of coarsely ground green peppercorns), but somehow manages not to be overwhelmingly peppery. We made a few hearty salads that same week, so we were able to combine left over steak and left over salad to make some pretty awesome lunches. We also made Ina Garten’s Roasted Cauliflower Snowflakes to go with the steak. Neither one of us is a fan of cauliflower — we’ve both eaten enough mushy and bland florets to put us off the stuff for good — but we were willing to try this recipe. It turned out great and totally and completely changed our minds about cauliflower. We used a white head of cauliflower for this dish, but have seen some very pretty purple and gold versions in our local farmers’ markets, so we’re going to have to experiment. 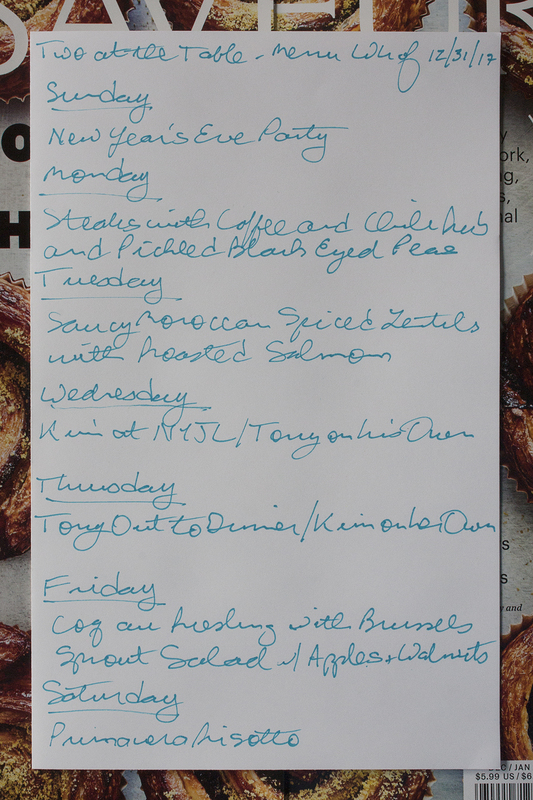 That said, we have six new recipes to try out this week, so we wanted to post our weekly menu and share them all. On Sunday night, we’ll make Food & Wine’s Chicken with Charred Rosemary Vinaigrette. We had originally planned to have this last night (Saturday), but just didn’t feel like cooking, so we moved it to Sunday night. We’ll have the chicken with The New York Times’ Kale Salad with Apples and Cheddar. We plan to make the full recipes, so we’ll have enough for lunch a day or two this week. We’ll have seafood on Monday night, specifically Ina Garten’s Prosciutto Roasted Bass with Autumn Vegetables. We’re making two changes to the recipe, one a bit major and one a bit minor. For the major change, we will use cod instead of the striped bass or halibut called for in the recipe. This will save us a little money, and we think it won’t impact the recipe too much. We’re also going to eliminate the potatoes from the “autumn vegetable” mix. This is partly because we’re trying to watch our starch intake and partly because the other vegetables in the recipe (butternut squash, parsnips, and carrots) sound more exciting than potatoes. We’ll return to a chicken dish (and a Food & Wine recipe) on Monday night, when we make Food & Wine’s Chicken, Wild Mushroom, and Roasted Garlic Sauté. This a “test run” for this dish, in that if it turns out well — and we have no reason to think it won’t — we’re going to experiment with different kinds of mushrooms and see what we like best. Again, we’ll make the whole dish, so another yummy lunch to look forward to! We’ll go vegetarian on Wednesday night when we make Tasting Table’s Winter Greek Salad. As we mentioned above, we’ve made quite a few salads in the past few weeks, including Half Baked Harvest’s Roasted Squash, Caramelized Fig, and Feta Salad and Epicurious’ Sautéed Kale with Kohlrabi, so we’re excited to try another one. Kim will be on her own on Thursday, as Tony will be away on day trip to Washington, DC. We also have plans for Friday night, when Kim, along with six of her fellow volunteers, will be officially announced as one of the New York Junior League’s 2017-2018 Outstanding Volunteers. We’ll be back in the kitchen Saturday when we make The Kitchn’s Easy One-Pot Chicken Taco Soup. We always like having soup around in the fall and winter and if the weather next weekend is like it’s been this weekend (i.e., COLD! ), having a big pot of soup to warm up the apartment sounds just about perfect. This recipe also sounds like the kind that makes us look for excuses to walk down the hall (“I’m going to go recycle this Post-It note!” and “I need to ask the neighbors if I can borrow a cup of water!”) so we can walk back into our apartment over and over and enjoy just how great our home smells! We don’t have much cooking planned this week, so we thought it would be fun to tell you about this year’s version of Oktoberfest. On Friday the 13th (!) , we continued our several-years-old tradition of having friends over for an Oktoberfest dinner and beer tasting. Our friends Lynee and Rich were able to join us this year. We can’t claim everything was authentically German, but we had a great time and a very nice dinner. We started, as we have in past years, with Alton Brown’s Homemade Soft Pretzels. This is not a very hard recipe. It certainly does help if you have a little experience making bread or pizza dough, but it’s not absolutely necessary. This is definitely a time and labor-intensive recipe, however. First, you have to make the dough — a stand mixer is a HUGE time saver here! — and then let it rise. Next, you have to roll out the dough and form the pretzels. Then, you boil each pretzel for 30 seconds in water with baking soda; brush the pretzels with a mix of egg yolk and water; and sprinkle on plenty of coarse salt. Last but not least, you bake them for about 12 to 14 minutes. This was, without a doubt, the best batch of pretzels Tony has ever made, for a few reasons. First, Tony let the dough rise a little longer than in the past, which made the pretzels fairly light. As our readers know, we have a very small kitchen, so there is not enough space to roll the dough out to the 24-inch length called for in the recipe. Tony got creative this year: once he had rolled out the dough as much as he could, he picked it up by the ends and let its own weight stretch it out a bit further. After doing that, forming the pretzels was very easy. Working with a longer strand meant the pretzels also retained their shape better after cooking. Unlike past years, Tony also used a low-sided pot for the water bath, which made it easier to fish out the pretzels after they were boiled. (You should be aware, though, that regardless of what kind of pot you use this step is messy, as any boiling water that spatters out of the pot — and there will be some! — is going to leave a white mark wherever it lands because of the baking soda. If you follow a clean-as-you-go approach, you can wipe down your stove and counter tops while the pretzels bake.) Tony used a lighter touch when brushing on the egg wash than in past years, so the pretzels had a nice shine without being eggy, but a heavier hand with the salt, so the pretzels were nice and flavorful. He also let the formed, boiled, brushed pretzels sit for about 15 to 2o minutes before putting then in the oven. As you can see below, they came out beautifully. We served the pretzels with grainy and smooth Dijon mustards and Food 52’s Beer Cheese. We had never made the beer cheese before, but it was fantastic. It was smooth and creamy with a bit of heat from cayenne pepper and Tabasco sauce and a nice kick from the Worcestershire sauce and beer. It was a big hit; the mustards were more or less ignored. We had the pretzels with Hofbräu Oktoberfestbier, which was our favorite beer of the night. It was crisp, not too heavy or too sweet, and a perfect complement for the salty pretzels and spicy beer cheese. For our main course, we made Epicurious’ Pork Tenderloin with Roasted Apples and Onions. This was a very easy recipe and, as we hoped, turned out to be a great choice for a dinner party. One of the keys to a successful dinner party is that the hosts pick recipes that don’t force them to be in the kitchen the whole time. Because this dish is completed in four simple steps, it was very easy to complete half the work before our guests arrived. We seared the pork in a cast iron skillet and then cooked the apples and onions in the same pan. While the apples and onions cooked, we let the pork cool a bit, than rubbed the top and sides with grainy mustard and sprinkled on fennel seeds. We put the pork on top of the apple-onion mixture and covered the pan before our guests arrived. While we enjoyed out pretzels, we only needed to get up for 20 seconds to preheat the oven and another 20 seconds to put the skillet in the oven and cook everything, The last steps, further cooking down the apples and onions with some apple cider, slicing the pork, and then serving everything, took less than 10 minutes. We were able to spend most of out time with our guests and very little in the kitchen. Also, in the interest of not spending the whole day cooking, we made dessert and the beer cheese the day before and served some store-bought green beans and roasted red potatoes as our sides. Dinner turned out very well. The pork was cooked nicely and the apples and onions were a nice accompaniment. 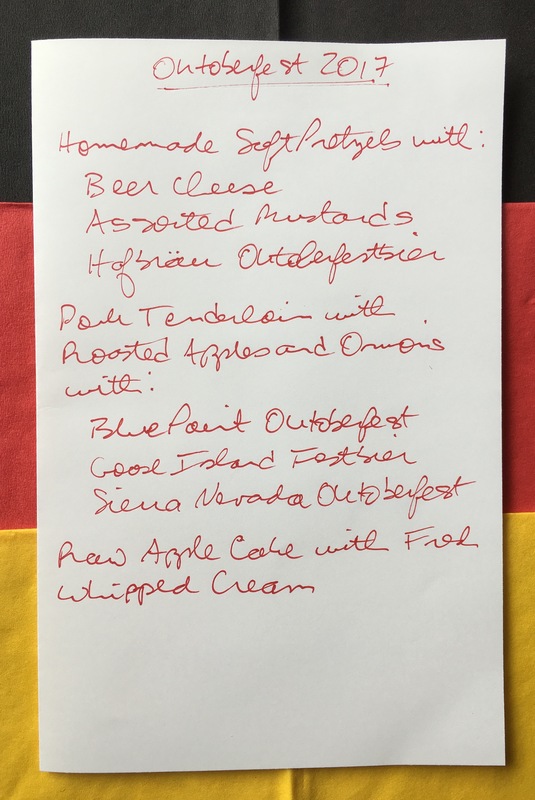 We served dinner with three beers: Blue Point Oktoberfest, Goose Island Festbier, and Sierra Nevada Oktoberfest. Everyone ended up ranking the three dinner beers in that order as well: Blue Island as the best of the three, Goose Island as second, and Sierra Nevada as third. For dessert, we made Stone Gable’s Raw Apple Cake. We had this at a friend’s house not too long ago and we knew immediately that it would be perfect for our Oktoberfest dinner. It’s very easy, even for an inexperienced baker. The apples that go into the cake don’t have to be peeled, which saves a lot of time. Plus, it’s a “dump cake” as in, you dump the wet ingredients into the dry, mix them together, and dump the dough into a cake pan. 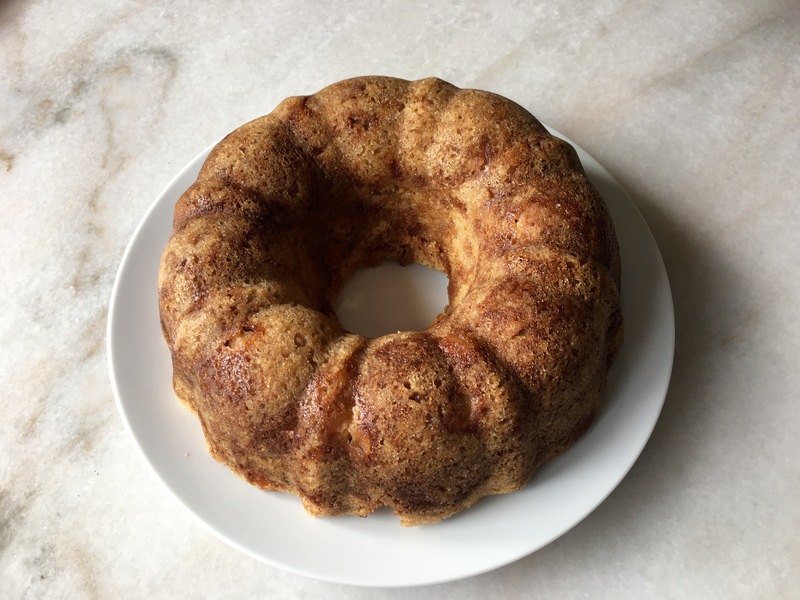 (Dough is the right term here; the cake starts out more like cookie dough than cake batter.) The cake takes a little while to cook, about an hour or so, but we knew the time would be worth it because the cake was so good. Plus, having the apartment slowly fill with the warm smell of apples and cake was a huge bonus! The cake was a hit, as was the fresh whipped cream that we served along site it. The best part was we had plenty of leftover cake (and pretzels, beer cheese, and pork!) to keep us happy for the following week! We have yet another very busy week, with a visit to see our friends Tom and Sharon in Maplewood, New Jersey and a talk/interview by Jeffrey Eugenides at the 92 Street YMCA. 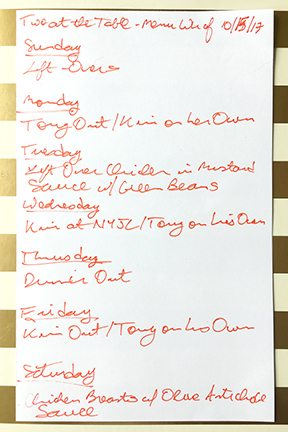 We also have several nights where either Kim or Tony is out for dinner, so we won’t eat together those nights. So, we only have new recipe this week, but it should be a good one. Our other dinner together this week will be on Saturday night. We looked for an easy recipe that would use two chicken breasts we have in the freezer, and we think we’ve found a good one: Food & Wine’s Chicken Breasts with Olives-Artichoke Sauce. The recipe uses Kalamata olives, which we almost always have around, and feta cheese. It also calls for using frozen artichoke hearts (this is a big part of why the recipe is so easy), but we decided to go with canned. We’re going to ask our friends at Columbus Wine and Spirits to suggest a white wine to pair with dinner. They may select something from Greece, but they always have a surprise for us up their sleeves, so we know better than to guess!